Henry Guy Lucas, ‘Guy’, was born in Sunninghill, the fifth of 10 children born to William Henry Lucas from London and Ellen Abbott from Southampton. William was a domestic coachman and Ellen a coachman’s daughter which may explain how they met. Their marriage in 1888 was registered in Easthampstead, Bracknell. William’s work as a coachman often included accommodation and in the early 1890s, William and Ellen and their two children were living in the coach house at Pembroke Lodge, Kings Road, Sunninghill. William was very probably working for the owner of the Lodge, Sir George Pigot, 5th Baronet, while Ellen was working as a servant. By the time of the 1901 census, the Lucases, with seven children including young Guy, were living at Winkfield, on the estate of Fern Hill Park (now a Grade II listed mansion). Lady Mary Trefusis lived here in 1901 and, although it’s not clear from the census, there is a strong possibility that he was a coachman for Lady Trefusis. Lady Mary was a daughter of Charlotte Montagu Douglas Scott, Duchess of Buccleuch, of Ditton Park. The Lucases moved to Datchet in the early 1900s and the 1911 census shows they were living in a four-roomed cottage at Leigh House with six of their 10 children. William was still a domestic coachman and was very probably working for the Cholmondeleys at Leigh House. This grand house and its grounds occupied a large area of land between London Road and Horton Road. The final owners of Leigh house, before its demolition, were the Cholmondeleys, Lady Susan Caroline and her daughters Marcia, Mabel and Eva. Lady Mabel was at Leigh House in the 1911 census when the Lucases were living in a cottage there. Lady Marcia and Lady Eva had married two brothers, Percy John de Paravicini and Henry Farquhar de Paravicini from Riverside House in Datchet. The families contributed greatly to the war effort in the village, taking the lead in many local and wartime organisations, whether running them, fundraising or contributing practical help. By 1911 Guy had found himself a job as a gardener in Weybridge. He was living at The Bothy, Brooklands Gardens, in a seven-room dwelling with six other servants – three domestic gardeners, and a chauffeur, poultryman and a nurseryman. (A ‘bothy’ is a building or shelter providing accommodation for gardeners and estate workers.) At just 16, Guy was the youngest there. Brooklands must have been an exciting place for a young man to work. The owner of Brooklands was Hugh Fortescue Locke King who founded the motor racing circuit and airfield there. Young Guy, working in the gardens, would no doubt have been aware of the sound of engines roaring around Brooklands race track and seen the aircraft flying overhead. Tommy Sopwith, who caused much excitement by landing his bi-plane on Datchet golf course in early 1911, opened a flying school at Brooklands in early 1912. Two of Guy’s brothers, Arthur and William, also enlisted quite soon after war broke out. Their names appeared with Guy’s in the local newspaper on 9 January 1915 in the Datchet Roll of Honour. Guy was in the East Surreys, Arthur on HMS Ganges, and William in the Royal Garrison Artillery. The war started in July 1914 and Guy enlisted in Weybridge, Surrey, later that year. He became Private 2001 of the 2nd Battalion, East Surrey Regiment, and landed in France in February 2015. By early May he was dead. The 2nd Battalion of the East Surreys was in the 85th Brigade of the 28th Division. On 19 January 1915, they were mobilised for war; they landed at Havre and very quickly moved up to the line. They were heavily engaged in the Ypres sector and just five days after arriving in France, scarcely 200 men remained of the 1000 who had disembarked. Reinforcements were needed and Guy Lucas, one of those reinforcements, arrived in France on 23 February 1915. 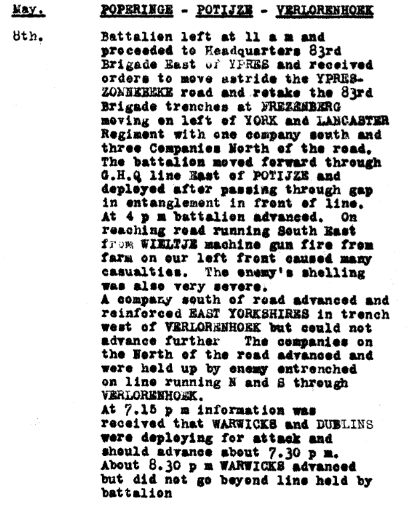 From 8-13 May 1915, the 2nd East Surreys were engaged in the Battle of Frezenberg Ridge. On the day Henry Guy Lucas was later believed to have been killed, 8 May 1915, his battalion was ordered to retake the 83rd Brigade trenches at Frezenberg. The men were attacked by machine gun fire from a nearby farm and shelled by the enemy. They were not able to advance further than Verlorenhoek. Right: War Diary 8 May 1915 of the East Surrey Regiment, 2nd Battalion. To read more, click here. This information was sourced from the Queen’s Royal Surreys website where you can find more diaries of the 2nd Battalion of the East Surrey Regiment. There were 18 battalions of the East Surrey Regiment formed during WWI. Nearly 7000 men were lost and seven Victoria Crosses and 62 Battle Honours were won during the course of the war. Henry Guy Lucas was believed to have died in early May 1915 but this wasn’t confirmed until much later. 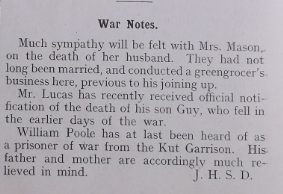 Below: An article confirming Guy’s death, appeared in the Datchet Parish Magazine in November 1916, 18 months later. Henry Guy Lucas was awarded the British War Medal, Victory Medal and 1914-15 Star. He is remembered on Panel 34 of the Ypres (Menin Gate) Memorial, Ieper, Belgium. This memorial bears the names of more than 54,000 officers and men whose graves are not known. Each night at 8pm the traffic is stopped at the Menin Gate while members of the local Fire Brigade sound the Last Post. 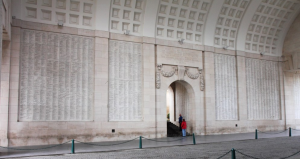 Menin Gate is one of four memorials to the missing in Belgian Flanders which cover the area known as the Ypres Salient, roughly from Langemarck in the north to Ploegsteert Wood in the south. The Commonwealth War Graves Commission website explains: The Salient was formed during the First Battle of Ypres in October and November 1914, when a small British Expeditionary Force succeeded in securing the town before the onset of winter, pushing the German forces back to the Passchendaele Ridge. The Second Battle of Ypres began in April 1915 when the Germans released poison gas into the Allied lines north of Ypres. This was the first time gas had been used by either side and the violence of the attack forced an Allied withdrawal and a shortening of the line of defence. There was little more significant activity on this front until 1917, when in the Third Battle of Ypres an offensive was mounted by Commonwealth forces to divert German attention from a weakened French front further south. 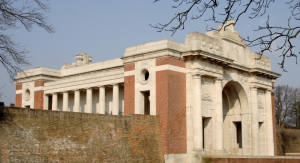 The site of the Menin Gate was chosen because of the hundreds of thousands of men who passed through it on their way to the battlefields. The above images are from the Commonwealth War Graves Commission website, to read more about the Menin Gate memorial, click here.